Academy Village Subdivision Tucson AZ is unique. Activities include social, physical exercise and learning. Every person can dive in and explore their interests. Explore local geology. Take a yoga class, attend concerts or social events. All are available. Academy Village Subdivision Tucson AZ residents are active. Their efforts have built a community that combines wellness, fitness, and intellect. Homeowner fees at Academy Village support the resident programs and services. Fitness programs, security, transportation services and common area maintenance. Academy Village Subdivision Tucson AZ offers a broad collection of services. For a complete list of services provided use the link for HOA Services. The community gives residents the opportunity to “get involved”. And most residents take part in setting community direction. The Academy Village Subdivision Tucson AZ reflects the vision of its residents. The Arizona Room is a focal point in the community. Residents can meet friends, attend lectures or large group events. The Academy Village Tuscon Cafe offers lunches, dinners, and meals on special occasions. 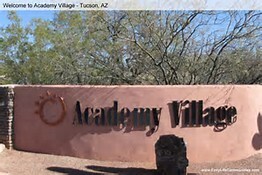 At the heart of Academy Village Subdivision Tucson AZ is The Arizona Senior Academy. It focuses on creating a life-long learning process. Educational and cultural programs support the community. We’ll brief you on buying a new construction home. And what’s unique about the process. Thinking about selling a home in Academy Village Or Other Tucson Area? We use multiple online marketing channels. Then we will build a stand-alone website built to show your home. Our marketing program targets key U. S. cities. Cities where Tucson home buyers come from. For luxury homes, our drone service provides video of your home and neighborhood. This video along with professional photos helps the online buyer see and feel your home.